The day almost a year in the making is nearly here: Ottawa’s Martello Technologies will ring the bell on the TSX Venture Exchange as it begins public trading on Wednesday morning. The local cloud communications service firm, which completed its reverse takeover transaction of a Vancouver-based shell company last month, will list its shares under the symbol MTLO starting Sept. 12. As CEO John Proctor and the Martello team ring the bell on Wednesday, it will culminate the firm’s most ambitious year to date. Last September, then-chief executive Bruce Linton told Techopia Live that the company would be looking at “an acquisition or two,” with the possibility of going public in the coming year. Those predictions came true. 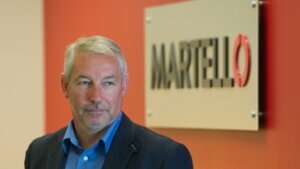 In addition to this latest reverse takeover, Martello kicked off 2018 by merging with Montreal’s Elfiq Networks. Proctor, who took the reins of the firm in December, told OBJ then that the acquisition would double the firm’s size and complete its product offerings. He explained the tech side of things later in the year on Techopia Live. Martello’s communications services aim to keep telcos online as they meet rising demands for bandwidth – adding Elfiq to the mix expands Martello’s issue detection services with remediation and troubleshooting capabilities. “I wouldn’t say we’re going to be a disruptive technology. I’d say we’re an enabler of these disruptive technologies, given the bandwidth they can get at,” he said at the time. Backing up Proctor’s claims, last month Martello won an internet telephony product of the year award from tech marketing firm TMC. In the lead up to the reverse takeover, Martello would bolster both its bench and bank account, bringing in Erin Crowe as CFO and raising $7.5 million in a private placement. The occasion hasn’t been lost on one of Ottawa’s tech giants, Wesley Clover founder and Martello co-chairman Terry Matthews. “This TSX-V listing is the next significant milestone for Martello,” he said in a statement.